Our idea of meditation is mainly influenced by two aspects, the visual and the practical aspect. The mind’s uniform picture of a meditating person is someone sitting still in a peaceful environment, in a monastery or on a mountain. Concerning the practical aspect of meditation, the ideas vary. The meditation trainers primarily concerned with furthering the well-being of their students tend to advise to focus on something positive, uplifting – be it a special colour (gold, red) or the visualization of a positive image – while the “purists”, who aim at purifying the spirit, try to empty the mind completely, focusing on the process of breathing or on anything at all, some advocating the use of mantras as a guide into emptiness. Behind this, different traditions of meditation can be seen. In Chinese, the word for meditation is mingxiang: 冥想. Ming (冥) means dark, gloomy or deep. Together with xiang (想), which is generally translated as to think, to speculate or to consider, the literal translation of meditation would be “deep thinking”. the Chinese “thinking“ is not primarily connected with mind and thoughts, but with an action of the heart: The character xiang is composed out of the signs for tree (木) and eye (目) with the symbol for heart (心) below – “the feeling of looking intensely at a tree”. Thus, the notion mingxiang invokes an association of focus, in the sense of concentrating on one thing or one action, as well as an idea of going deep inside. For Cheng Man Ching, meditation does not depend on external stillness, but on the governing mindset of the action. Echoing Buddhist teachings, meditation is not about what you are doing (sitting still), but the way you are doing something, the expectation of what to get out of an action. 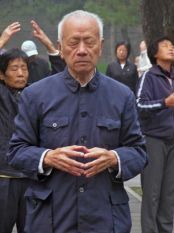 Thus, in teaching the meditative aspect of Taijiquan, Cheng Man Ching did not focus on standing postures like Zhan Zhuang or standing still in postures of the form while calming the mind. For him standing in the postures of the form was rather a means to memorize the postures and to get a basic feeling. Once the physical memory had grasped the postures after many repetitions and the student was able to establish a body status of the upper body as in sitting meditation throughout the whole form, s/he would be able to find stillness in motion – avoiding unnecessary, unconnected movements. This approach forms the basis of an understanding of Taijiquan as meditation in movement. 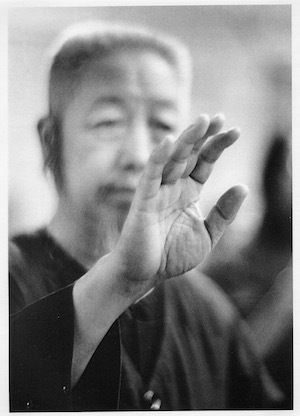 To develop the ability of “deep thought” or “deep feeling” in connection with the flowing movements of the form allows the Taiji-player to go deep inside the body with heart and mind.